for high-viscosity, paste-like and hardening substances. True to our philosophy of innovative ideas, excellent execution and perfect design, BOLZ INTEC has devised a complete drum emptying solution. 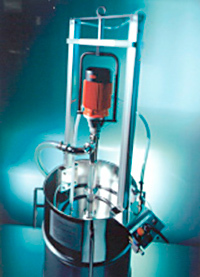 High-viscosity, paste-like substances such as greases, creams, pastes, silicone, paints or even tomato puree can now be emptied without difficulty from 200 l drums. Thanks to the BOLZ INTEC drum emptying system, such operations can now be performed quickly and cheaply. Under normal operating conditions, the system achieves a pumping capacity of 30 to 40 l/min. The system is ideal for use in the food, pharmaceutical and cosmetic industries. This innovative new product can also be used in a wide range of other sectors. Ask us for details – we will be happy to advise you.